The Native Hawaiian group Hālau I Ka Leo Ola O Nā Mamo returned home to Hawaiʻi in March of 2019 after spending over a week in Aotearoa-New Zealand. The trip focused on strengthening bonds of language and culture revitalization to be further shared with other Indigenous peoples. Hālau I Ka Leo Ola O Nā Mamo is a hālau hula, or hula school, where traditional and contemporary hula arts are taught. The hālau is pioneering the reestablishment of use of the Hawaiian language as the language of instruction and peer interaction in such schools, of which there are well over one hundred in Hawaiʻi. The establishment of Hālau I Ka Leo Ola O Nā Mamo has provided Native Hawaiian youth the opportunity to expand their Hawaiian language development in the area of traditional poetry as expressed in chant and dance. That background combined with their proficiency in conversational Hawaiian allows the students to encourage others in Hawaiʻi to bring hula and Hawaiian language together. The ages of the youth group of students range from 4 -18 year olds. Both sexes are represented. All members are students at Ke Kula ʻo Nāwahīokalaniʻōpuʻu (Nāwahī). Pacific crossroads position of Hawaiʻi provides students of the hālau many opportunities to share with other Indigenous peoples visiting Hawaiʻi as part of their efforts to begin revitalizing their languages and cultures. The recent trip to Aotearoa-New Zealand by the hālau was to further strengthen the bonds of Native Hawaiian and New Zealand Māori youth who are seen as international models of language and culture revitalization. The trip to Aotearoa-New Zealand built on earlier support of the hālau as a PAWANKA Fund partner in 2016. The focus of that partnership was the project “E Ola A Laupaʻi: Long Live the Knowledge of the Ancestors Through the Descendants”. The project sought to inspire contemporary hula schools to make more use of the Hawaiian language. It culminated with a hōʻike, or performance, for the Native Hawaiian community during the world famous Merrie Monarch hula competitions. As part of the Pawanka funded project, students and teachers of the hālau received specialized training in a number of dances and chants from a master of the art. The idea behind the visit by the hālau to Aotearoa-New Zealand was to reproduce the earlier Pawanka funded project on an international level. Students and families fund raised to make the trip possible. The teachers of the Hawaiian students, Pelehonuamea and Kekoa Harman, planned the cultural sharing between the Hawaiian and Māori youth to culminate in the Māori counterpart of the Hawaiian Merrie Monarch hula competitions. That national haka competition,Te Matatini Ki Te Ao, draws thousands and highlights the Māori language and culture of Aotearoa-New Zealand. During one of the several days of the haka competitions, the Hawaiian students were welcomed to Te Papa Tongarewa the Museum of New Zealand where they performed hula as well as chant and song. 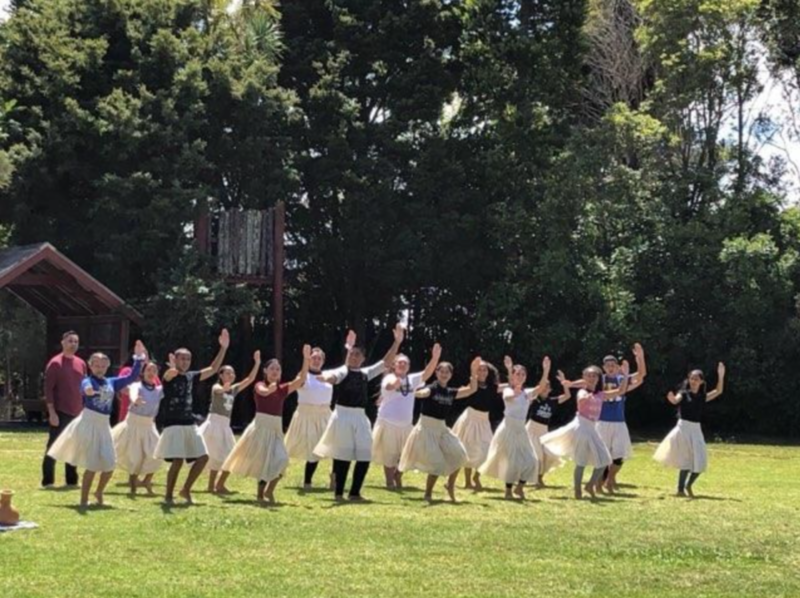 That performance allowed the hālau to share with the larger New Zealand public Hawaiian culture that had earlier been shared with Māori students in Māori immersion schools. A special part of the journey for the Hawaiian students and their teachers was a visit with Dr. Tīmoti Karetū. Dr. Karetū was awarded the Knighthood of the New Zealand Order of Merit in 2017 by the Queen of England for his work in Māori language revitalization. Tīmoti has been a long time friend of the Hawaiian language revitalization movement and the pioneering non-profit ʻAha Pūnana Leo. He and his fellow Māori colleague, Dr. Tāmati Reedy, were instrumental in assisting the establishment of the Pūnana Leo language nests as the first language nests in the world outside their original Aotearoa-New Zealand point of origin. Thus the Kōhanga Reo and Pūnana Leo language nests movements were born only a year apart. The recent journey of Hālau I Ka Leo Ola O Nā Mamo to visit Māori cousins brought another generation of Native youth together to strengthen their knowledge and commitment to the traditions, culture and language of their peoples. With such expanded knowledge and commitment, Native Hawaiian language activist youth have become even stronger in their ability to share with other Indigenous peoples who visit them in their home islands.